We have French toast, French cuffs, French nails, French food, wine and even a kiss, so why are French rugs not well known? Most likely it is due to their cost; the rugs we will look at this time are expensive. The first rug is the Savonnerie. This rug is not often encountered in commercial rug cleaning circles, but be aware of them in case one does come in for cleaning. The methods used to create hand-knotted carpets were introduced to France by the weaver Pierre Dupont, and the rugs became an important industry during the reign of Louis XIII (1610-1643). The West’s fascination with rugs from the Orient and the desire to keep the gold and silver being spent on these imports drove Dupont and the French kings to establish their own hand-made rug industry. Initially, Dupont set about his work at the Louvre, where talented artisans could flourish under royal patronage. Dupont formed a partnership with Simon Lourdet to produce rugs in 1627. The Savonnerie rug factory was established in a former soap-making facility outside Paris. The term Savonnerie means “soap works or soap factory.” They were protected by the King, so as prohibiting the importation of Oriental or other foreign rugs into France. In the late 1660s the Savonnerie rug came into its own with large commissions by Louis XIV. In 1825 the Savonnerie works were moved to the Gobelins factory in Paris, now operated by the French Ministry of Culture. In the last half of the 20th century, India and China produced hand-knotted pile rugs with simplistic, hybrid designs derived from Savonnerie and Aubusson rugs. This brings us to the next French rug – the Aubusson. 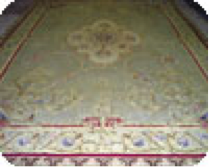 Until recently, the most expensive rug sold at auction by Sotheby’s was an antique Aubusson for $1 million. It is currently taking up residence in a Manhattan apartment. Aubusson is a town approximately 200 miles south of Paris that has a long history of tapestry weaving. The weaving of wall tapestries in Aubusson reached its pinnacle in the 16th and 17th centuries. 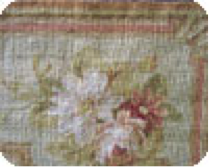 Beginning in the 1770s, wallpaper become increasingly popular and led to a decrease in demand for wall tapestries, leading Aubusson to redirect its tapestry production to tapestry woven carpets, or “tapis ras.” While knotted-pile rugs were still woven up to the 1870s, this flat-weave production became such a success that the name Aubusson became synonymous with French-design tapestry woven carpets. Unlike wall tapestries with their pictorial, directional designs, Aubusson tapestry carpets consisted of floral, architectural, oriental and armorial designs (Image III and IV). Today, tapestry and Savonnerie-style knotted rugs are made at the Saint-Jean Factory in Aubusson. China produces an excellent tapestry woven rug in the Aubusson style (Image V). The Chinese copies, however, do not have a lining. In Aubusson “tapis ras,” the warps are usually cotton and the wefts are wool. 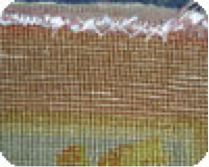 Similar in weave to kelims, the warp threads form slight ribs across the fabric. 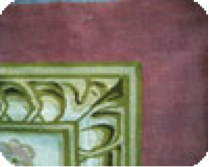 Slits are formed in the fabric where design lines are parallel to the warp, and wefts do not share the warp for color change. The selvage on the two ends is hemmed under, and linen lining is usually sewn to the back. Both Savonnerie and Aubusson rugs are expensive. You may want to call your insurance company – no, I’m not joking – to see if you need a binder while they are in your plant for cleaning. Cleaning considerations for both: be aware. What seems to be sound when dry can tear when wet. If the rug is fragile, surface cleaning is recommended. A fiberglass screen may be placed over the rug to reduce the potential of tears from pre-cleaning vacuuming and wet-cleaning with a wand. Use cool water temperature and WoolSafe-approved cleaning products. Watch for dry-rot with any plant-based fibers in the rug foundation.